Have you ever been stuck in a freezing airplane cabin without a blanket? 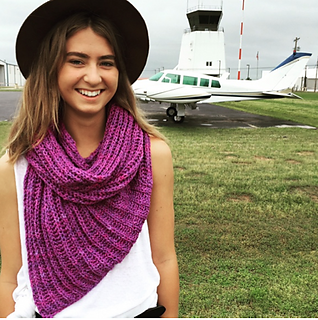 Wear the Mile High onboard that flight and you’ll always have a “shlanket” ready to wear! Cozy, squishy brioche stitch is even better in hand-dyed Prism Clicket cotton. This is brioche, simplified. This pattern is one of dozens available for free to LoopsClub members. For more information about joining LoopsClub, visit LoopsClub.com.